I’m really pleased with it. I am really enjoying knitting these. 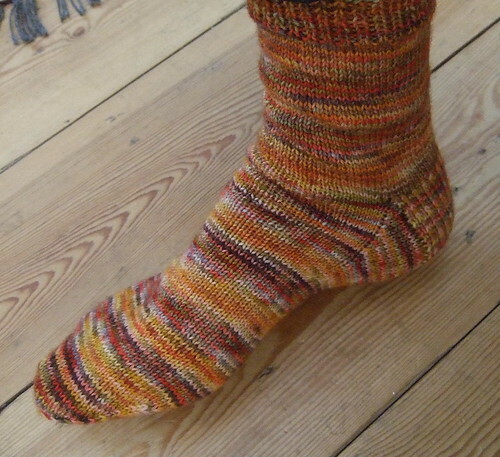 I think it’s because I’m doing a simple stocking stitch pattern, with minimal ribbing – a nice simple mindless project with the variegated yarn providing some interest to the knitting. 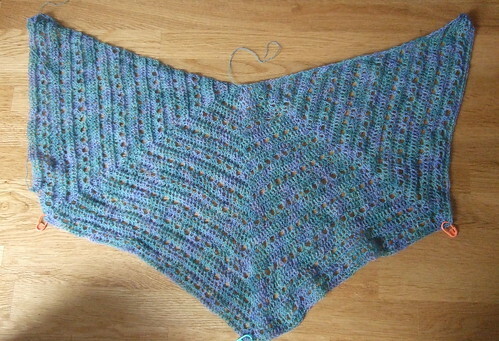 I will be spending all my available knitting and crochet time this week trying to finish the Spring Shawl. I need to get it finished by Friday night, so that I can block it in time for my mother’s birthday. I think I am about halfway there at the moment. I really hate knitting or crocheting to deadlines, as I usually fail, and I find that it takes away a bit of the fun. I know my mother will love this shawl – she really appreciates my handmade gifts, so I will make every effort to get it done in time! Is that Spring Shawl an Eva’s Shawl or a new pattern? It’s gorgeous. 🙂 What yarn is it? Heather, full of questions today! Yes it’s another Eva’s shawl. The yarn is Margaret Stove Atisan Lace.